Mark Grayson is the son of Omni-Man, one of the greatest superheroes on Earth. When his powers manifest as a teenager, he decides to follow in his father's footsteps, taking the name Invincible and battling evil. His career seems off to a good start, as he meets extraterrestrial champions like Allen the Alien and teams up with heroes his own age, like Atom Eve. But when the truth about his father comes to the surface, his understanding of the world will never be the same. I read the first few issues of Invincible, and wasn't at all impressed. Each issue took about 30 seconds to read, and the story just seemed derivative. On the recommendation of the guy at my local comicshop, though, I gave the story a second chance - and once you get past those first few issues, the comic turns out to be great! The trite beginning was just to lull you into a false sense of security before turning the world upside down. 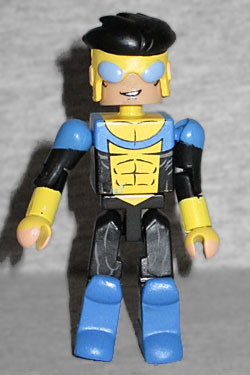 Invincible has worn several costume variations over the years, but this figure is based on the original. The costume is bright blue and black, with yellow gloves and a symbol that coincidentally looks like the Image Comics logo. He has bootfronts to create his big kneepads, but is missing the weird black cutouts on the inside of his legs below the knee. The design of his mask is problematic. It looks just like Cory Walker's design, right down to the shape of the hair, but it sits too low on his head. Way too low. If you push it all the way down, his mouth is in the mask's nose hole; if you only push it down far enough that the lower edge of the mask meets the lower edge of the head, the goggles end up down on his cheeks. Basically, if you want the face to line up properly, you have to just barely rest the mask on top of the head. There's no reason this kind of flaw should have made it all the way to the finished product. The set also includes a black hair piece for when you remove the mask, but is much more detailed than the style of the figure calls for. Omni-Man, as the back-of-the-card text states, is Invincible's dad. 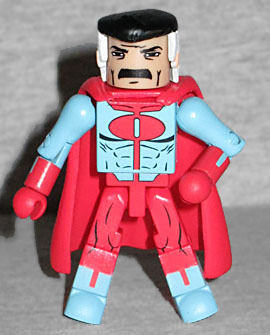 His secret identity is Nolan Grayson, and he's basically a knockoff of Superman with one important difference - he has a mustache. In fact, all his people have mustaches. It's their hat. It's actually a bit surprising that their women don't have mustaches, too. Befitting his status as an ersatz Clark Kent, Omni-Man is wearing Superman's cape. The rest of his costume details are just painted on, of course. Fittingly, his costume is blue and red, though the blue is lighter than Supes'. There's a big stylized O on his chest, and thin, straight lines used as design element on his gloves and boots. His hair is a new piece, black on the top and white around the sides. It's just a shame that the limitations of the form mean that his fine moustachio cannot be a big, bushy three-dimensional element. If there's one thing Robert Kirkman is good at, it's giving characters silly pun names. 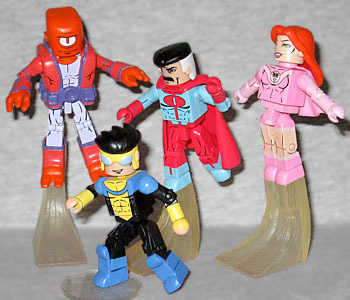 Invincible features people called Dupli-Kate (and her brother, Multi-Paul), Rex Splode, Shrinking Ray, and of course, Atom Eve. Eve's powers are pretty much the same as Molecule Man's: she can alter matter on the atomic level, converting it to anything she wants. Also it makes her poop. Invinicible is a weird book sometimes. Eve's costume is pink. Pink on pink. Two shades of pink. 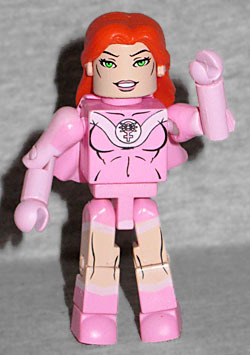 Pink isn't a color used on a lot of superhero costumes, so Eve totally owns the look. There are thin black outlines between the two colors on her chest, but nowhere else - unfortunately, the pinks are so similar that you really need those outlines to make them stand apart. Her hair is a new piece, designed to fall far enough away from her back that there's room for her short little cape (another new mold). But why no pink energy blobs for her hands? That's how her power is portrayed in the comics. Finally, we have Allen the Alien. A mysterious being who came to Earth several times in the past and fought Omni-Man before being driven off, his name was revealed when Invincible (who was filling in for his dad at the time) took the time to actually talk to him instead of just punching. Well, "talk," quote/unquote: they were in the vacuum of space at the time, and could communicate only because of Allen's telepathy. That's how Invincible learned that Allen wasn't an invader, but rather a "Champion Evaluation Officer" for the Coalition of Planets - it's his job to make sure a world's defenses are up to snuff. Allen is a big inhuman guy, so he gets some unique pieces to bulk him up and dehumanize him. Allen's outfit is a grey bodysuit under a red jacket and a big purple belt. The chest cap is new, as are the hands and feet - he only has two fingers and toes, and he's far too big to reuse Nightcrawler pieces. He also has a waist extender hidden in there; it's purple, so it blends in with his belt. The head is standard, but it's got a new cap over it to at least make an attempt at the weird shape of his noggin. It doesn't quite work, but at least they put the effort in, right? 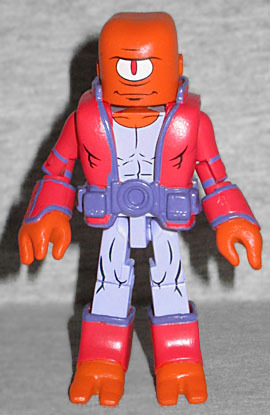 His one eye is painted on, contrasting nicely with his orange skin (which is more than we can say for his red clothes; honestly, who puts red and orange together?). The set includes disc bases for all four figures, as well as three flight stands. Three? There are four flying characters in the set, and three flight bases. Who's going to be left standing on the ground? There are two single-foot bases, and a two-footer. Unfortunately, none of them are cast from pink plastic (again, Eve's powers are colored pink, including when she flies), but that would only limit the usability, wouldn't it? Still, if you're a fan of the comic - and if you've ever read it, you probably are - then this four pack is a nice offering.